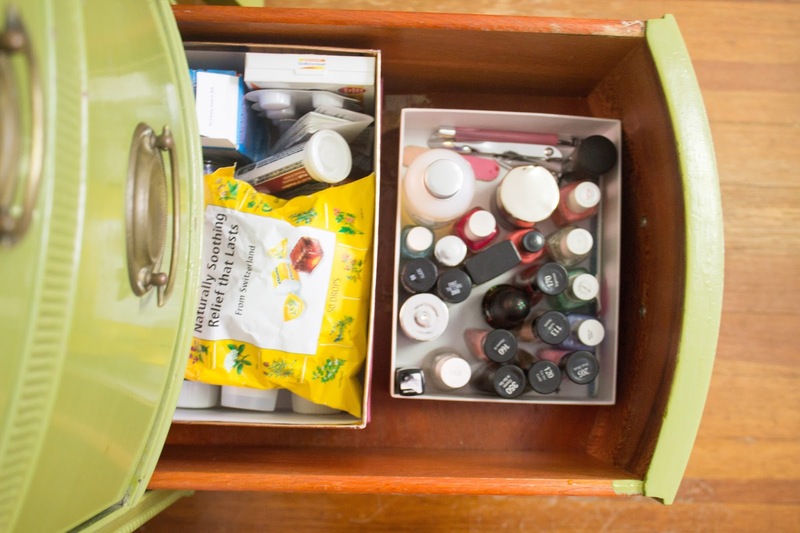 Last week, I opened a drawer in my vanity and felt overwhelmed. There was just too much. 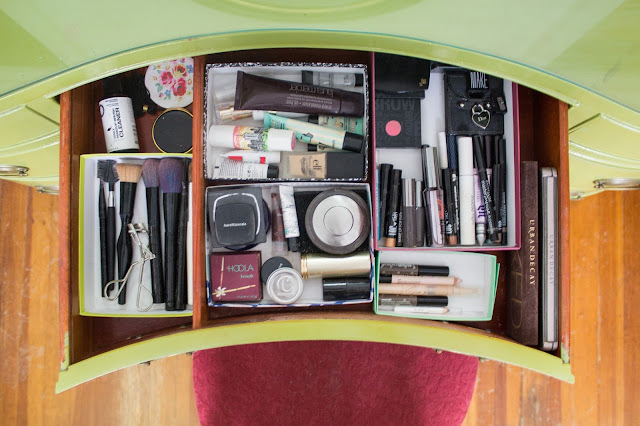 There were products I hadn't touched in years and no real form of organization. I decided to change that right then, starting at 11:00pm and ending at 1:00 in the morning. 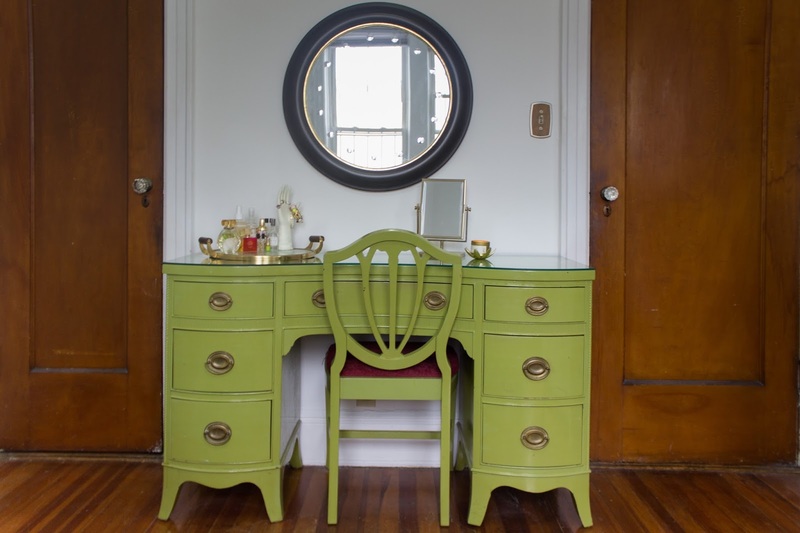 Let me start by saying that I am in love with my vanity. It's a hand-me-down from my mother, a gift from when I moved to New York after college. 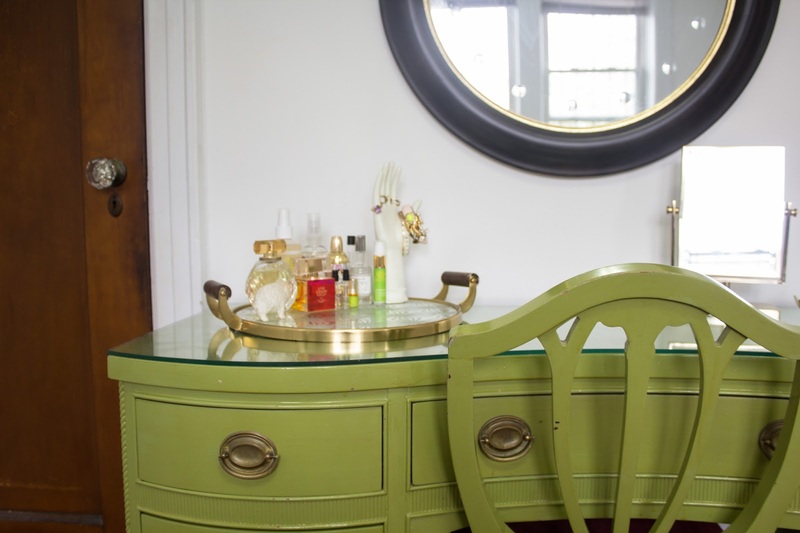 She found it one summer in our favorite Avalon antique store, and the gorgeous green is the original color. 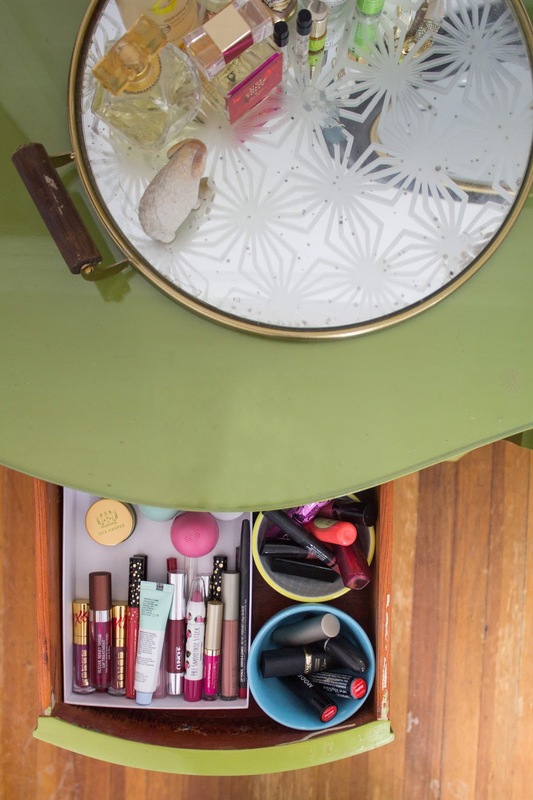 I was determined to make the inside drawers look as beautiful as the outside. 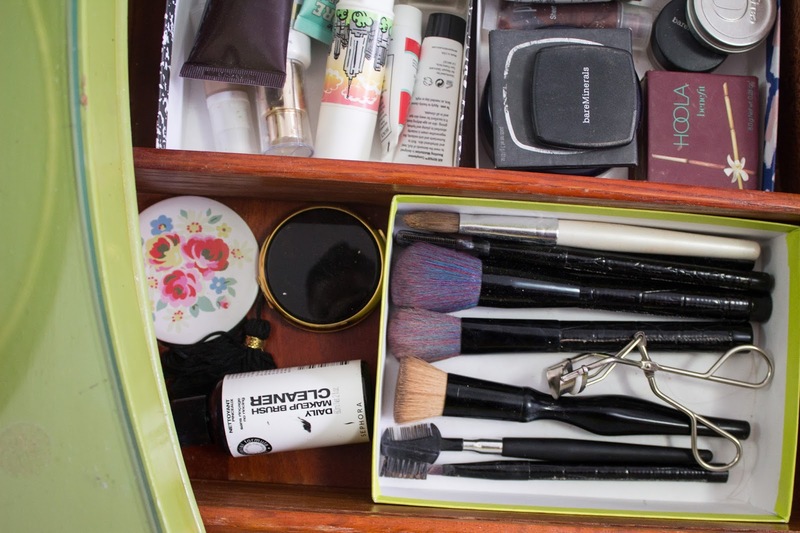 I started by editing the products I keep on top of my vanity. I chose things that not only have beautiful packaging, but that I would reach for everyday. 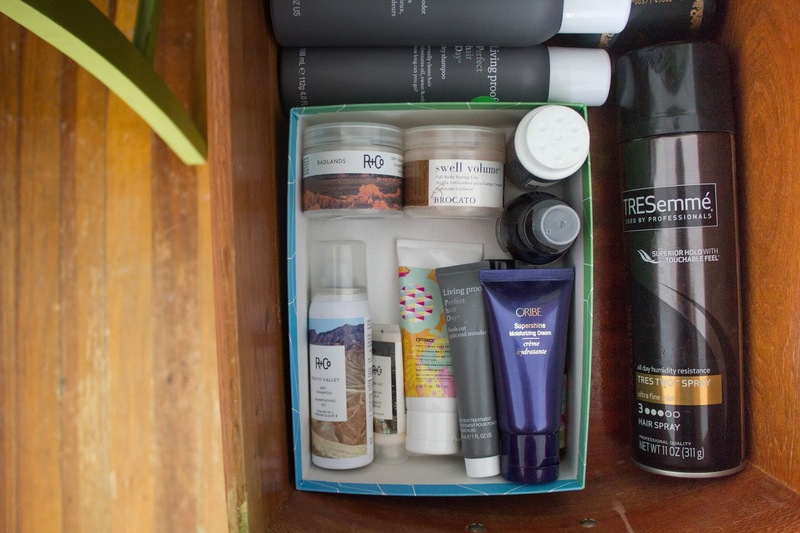 Pretty perfumes, moisturizers and hydrating mists all made the cut. If you're looking to pare down your own table top products, I would definitely recommend using a tray. 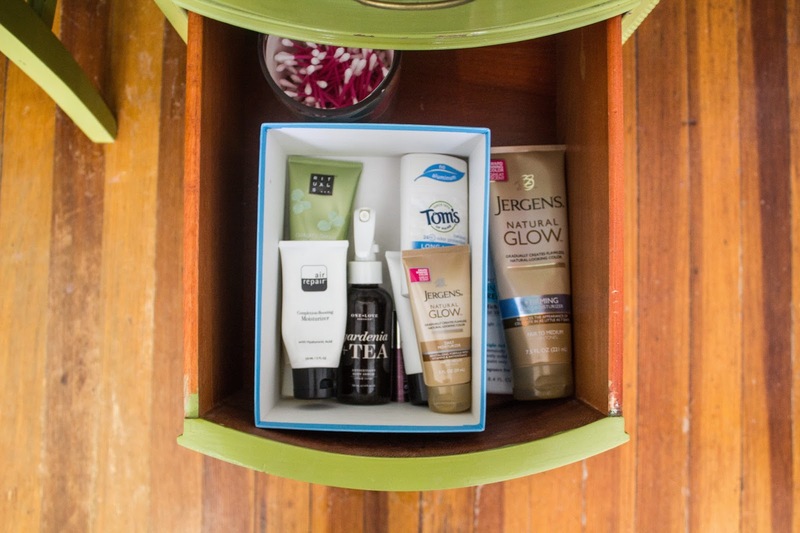 It helps products to stay contained and keeps them looking like they're supposed to be there. 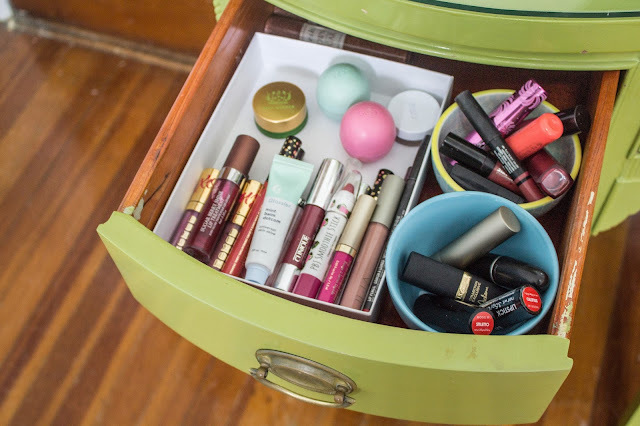 Going through my lip product drawer was easier than I expected. I was very honest with myself about what I use and what I don't, and ended up getting rid of a little over 1/4 of what I had. I added a box lid to hold gloss and balms, a bowl for sticks, and a final bowl to hold products I wasn't sure if I would use. If in another few weeks, I find that I haven't touched that bowl, those products will be gone too! 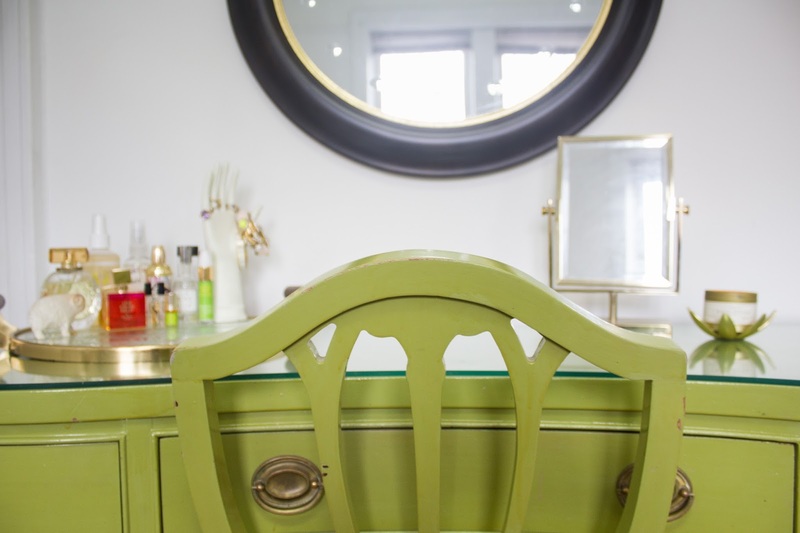 I love to keep candles everywhere, but especially on my vanity. 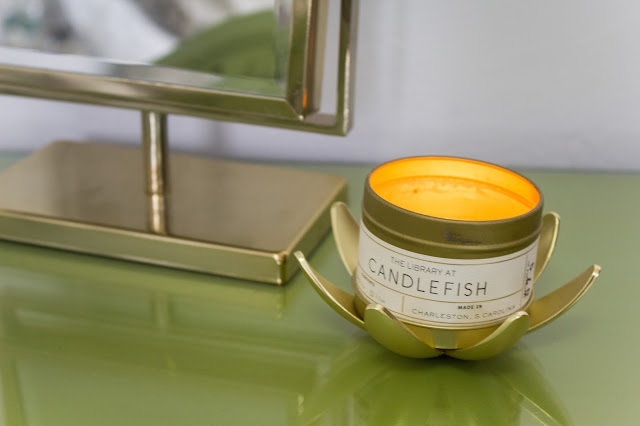 This one from Candlefish is the perfect size and so gorgeous. I like to light it at night before I go to bed. This middle drawer was probably the most chaotic to start. I once again got rid of anything I didn't use. In some cases, I found that I was holding on to things more for the brand than the product, which is ultimately just a waste of space. To create more compartments in this massive drawer, I up-cycled my birchboxes, then grouped my makeup according to function. From left to right, I have tools and compacts, foundations and primers, blushes and highlighters, eye makeup, and brow products. 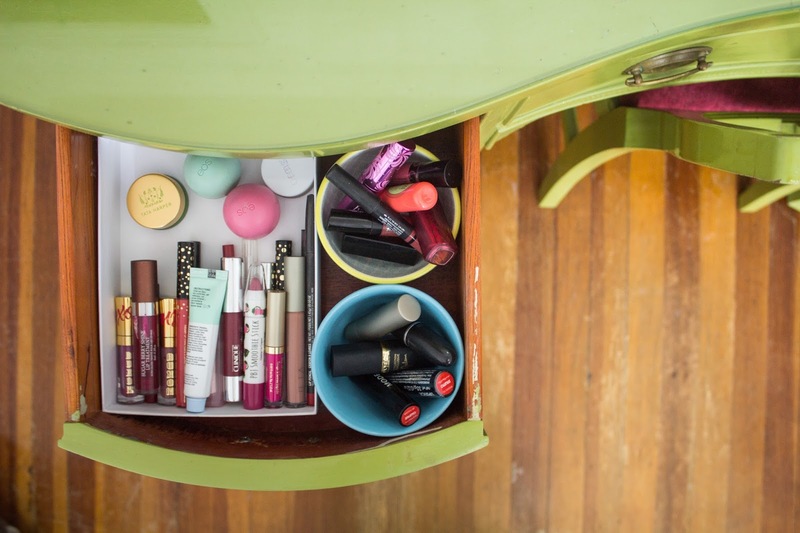 The new organization is totally calming when I get ready in the morning. I just love knowing that everything has a place. A bowl for hair ties, a tray for bobby pins and an old Kate Spade jewelry lid for earrings, keeps this drawer looking like organized chaos! Hot tools and brushes is the only drawer you could still call a mess. Although, I honestly can't think of a better way of doing this. You can't win 'em all, amiright? Although, I'm open to recommendations. 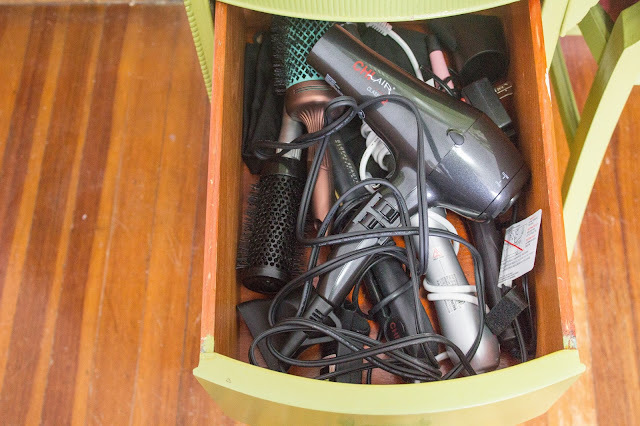 Time for haircare -- This drawer is where I definitely got rid of the most products. I don't know why it's so easy to hoard hair products, but for me, about half had to go. 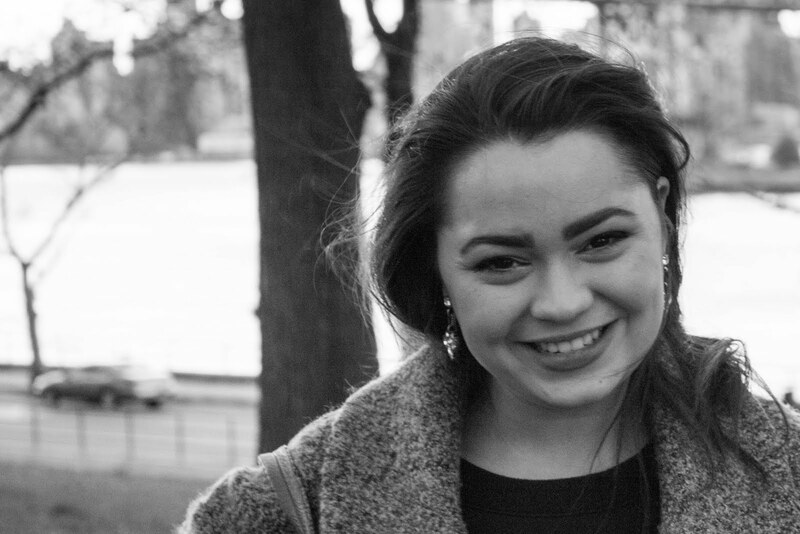 I edited down to essentials: hairspray, heat protecting spray, dry shampoo and stylers. Everything that's left, I love! 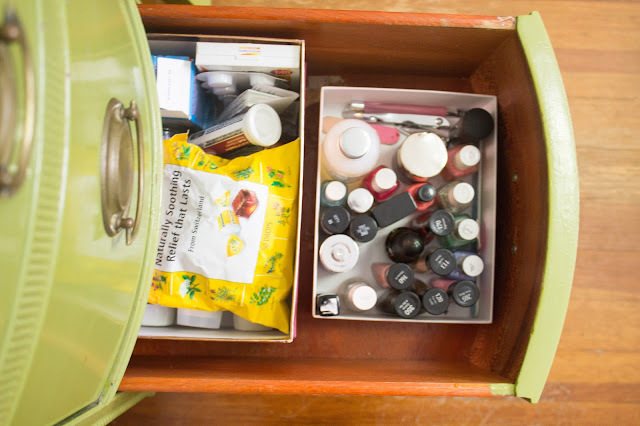 Nail polish and medicine live in a jumbled mess together no more! - Hooray! All things skincare and body here. 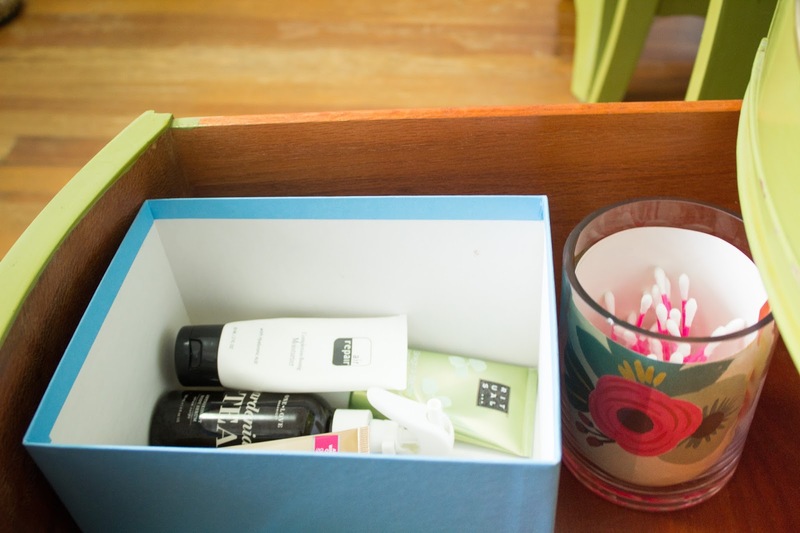 I didn't have a crazy amount to begin with, but a little box for organization and jar for Qtips goes a long way. 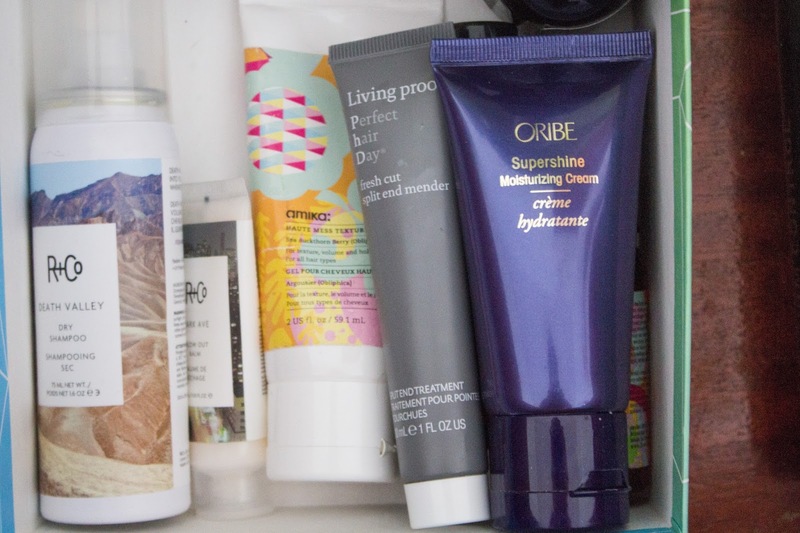 Although, my favorite skincare products actually live in my bathroom medicine cabinet and next to my bed for easy access. These include my Dr Jart Ceramidin Liquid and Cream, and my Tata Harper Resurfacing Mask. Oh, and in case you were wondering, I added the Rifle Paper wrapping to that glass jar. And there you have it -- my newly organized vanity. It's honestly like a breath of fresh air. My closet is the next (and more daunting) project -- I promise to keep you updated. Until then, if you want to check out a few more of my favorite makeup and skincare products, check out some of these posts (here, here and here)! PS. Full disclosure, I wrote this entire post and then rearranged the order of the pictures because they didn't go in order of the drawers (left to right, top to bottom). Then I realized absolutely no one would know that. Bottom line -- I need help.